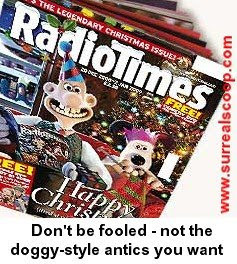 The BBC today received more complaints from disgruntled licence payers unhappy with the corporation's recent output and expressing dismay at the much anticipated Christmas schedule. Mr Billingsworth was expressing his concern that there was nothing in the Christmas schedule for the tens of millions of people who apparently listen to smutty talk of famous lives, judging from recent complaint rates. Mr Billingsworth has not given up hope for some festive entertainment and is pinning his hopes on the flag-ship programme of Christmas day. The BBC has defended its output saying that it was fulfilling its duty as a public service broadcaster to provide programmes for all areas of society.